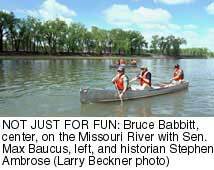 Last spring, Interior Secretary Bruce Babbitt got to have some fun. He took a raft trip on Montana's Missouri River Breaks accompanied by author and filmmaker Dayton Duncan and historian Stephen Ambrose, author of Undaunted Courage, a recent and highly popular telling of the Lewis and Clark saga. 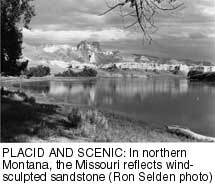 They floated past irrigated bottomlands and sage-dotted slopes, broad floodplains interspersed with high canyon walls, and eerie sandstone sculpted by water and wind. They may have sighted some of the deer and pronghorn antelope that feed in the croplands, and they may have spotted one of the bighorn sheep that perch on canyon overlooks. Shortly after the trip, Babbitt said he was considering an unusual "segregation" order for part of the river and about 90,000 surrounding BLM-owned acres along the existing Wild and Scenic river corridor east of Great Falls. The temporary order was needed, he said, to freeze development in the area, especially new mining activity, and to help managers prepare for an expected onslaught of visitors during the bicentennial of the Lewis and Clark expedition (HCN, 9/27/99). Babbitt's plan was met with wails of protest from area landowners and some local government officials. Many are still bitter over the 1976 designation of a 149-mile Wild and Scenic river corridor on the Missouri, and they argued that the federal government exerts enough control on the river and its adjacent lands. Opponents also feared the order was a first step toward a new national monument or national park along the river. Faced with growing opposition, Babbitt changed tack in July and withdrew the proposal. While he hasn't dismissed the idea of a national monument, he has distanced himself from talk of creating a new national park in the area, an action backed by Duncan and Ambrose, among others. Now, he's pushing for the creation of a new and expanded National Conservation Area along the banks of the Missouri, where, he says, existing land uses such as grazing and farming can coexist with recreation. He promises the federal government will be a good neighbor to those whose families have toiled on their land for the past few generations. "My principal concern ... (is) to provide more protection to the on-the-ground resources," Babbitt said in October. "We can do this while celebrating and continuing uses that are compatible with the protection objectives." While details are not yet fleshed out, Babbitt has asked the Central Montana Resource Advisory Council, which provides guidance to the Bureau of Land Management, to hold public hearings and come up with guidelines by the end of the year. He's asked the 15-member panel to develop proposals for managing the expected swarms of Lewis and Clark buffs. Also in the works is a potential permit system for river users, which would be a first for Missouri River floaters. The controversy seems to have died down for now, and the committee is working overtime to meet Babbitt's year-end deadline. "Overall, I think the process is working," says Great Falls conservationist Jim McDermand, who serves on the committee. "I think most everyone wants to keep (the river) as it is and protect it from the hordes of tourists who are coming." Ron Selden writes from Billings, Montana.